The top six teams in the Missouri Valley Conference are battling to keep their spots and make it to the conference tournament in Springfield, Missouri, Nov. 22 to 24 as the teams enter the midway point of the season. The MVC has traditionally placed multiple teams in the NCAA tournament, doing so 10 times in the past 12 years, according to Ryan Davis, the assistant commissioner for communications at the MVC. The Panthers of Northern Iowa is one of only three schools from the MVC to ever be ranked in the NCAA, and this year, they reached as high as No. 17 in the AVCA poll. This group of women were the only team from the MVC to be ranked at any point of the season, receiving votes in the most recent poll released on Oct. 8. Currently, Northern Iowa is undefeated in conference play with a record of 9-0, and sit at 13-6 overall for the season. They also lead the conference in kills per set with 14.87 and assists per set with 13.97, which also ranks the group eighth nationally. As it gets closer to the end of the season, the Panthers will look to junior outside Karlie Taylor, who currently leads the MVC in kills per set with 4.9. 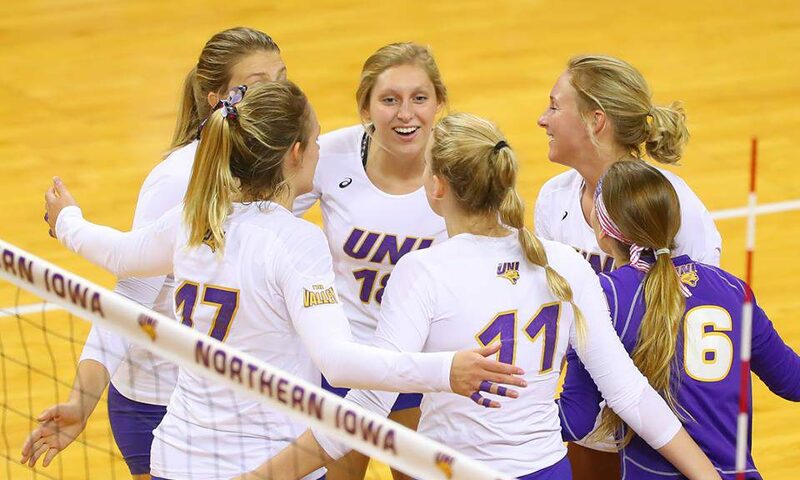 Northern Iowa is also led by redshirt-junior setter Rachel Koop with 807 assists. This group of women rallied together to currently rank second in the conference with a record of 7-1. Not only are they third in the conference, but the Redbirds rank No. 1 in the conference for overall hitting percentage with a .240. Leading Illinois State’s offense is freshman middle Marissa Stockman. This young player leads the conference with a .364 hitting percentage. Along with that, she tallied 72 blocks and 147 kills overall. Stockman is not the only player making an impact for the Redbirds. Sophomore setter Stef Jankiewicz currently sits at third in the conference for assists with 758 while senior libero Courtney Pence heads the defense, racking up 393 digs so far this season. The Bradley Braves sit in fourth currently with a conference record of 6-2. Although the team only sits in third place, it leads the MVC in four different categories and is ranked fifth nationally in digs per set. Senior libero Yavianliz Rosado sets the tone for the Braves’ defense with 5.62 digs per set, which ranks her second in the conference in that category. Also leading this Bradley team is senior outside Erica Haslag, who currently has 283 kills on the season, and senior setter Hannah Angeli, who controls the offense with 720 assists on the season. Sitting at 5-3 in conference play, the Crusaders sit at the top of the conference in almost every category. Overall, the team holds a record of 18-5. Sparking up the Crusaders’ lineup is sophomore middle Peyton McCarthy. She currently leads the MVC in total blocks with 95 and blocks per set with 1.25. Sophomore Rylee Cookery leads the backrow defense with 416 digs, which is also good enough to lead the conference. Brittany Anderson, a sophomore setter, sets the offense up for this young team, earning 897 assists for the season. With those numbers, Anderson ranks eighth nationally for assists in Division 1. Currently holding a record of 5-4 in conference play, Drake lands the No. 5 spot in the conference. When it comes to team statistics, the Bulldogs rank second in the conference for total team kills. One of the main contributors to Drake’s offense is senior outside Cathryn Cheek, who leads the team with 227 kills and 46 blocks. Setting up the team’s offense is junior Paige Aspinwell with 528 assists. While Aspinwell and Cheek take care of the offense, sophomore libero Kylee Macke contributed 341 digs so far this season to lead the defensive effort. The reigning MVC champions moved themselves up to the sixth spot in the conference standings. Following a slow start to the season, the Bears are making a comeback as the season begins to dwindle down. Leading the way for this young team is freshman outside hitter Amelia Flynn. She currently leads the team in kills with 235 and is second on the team in digs with 182. Freshman setter Chloe Rear also contributes to the offensive efforts, recording 657 assists during her first season of play. On defense, senior libero Emily Butters shines for the Bears, recording 387 digs on the season, which is good enough for a fourth place ranking in the conference. Four teams won’t make it to the conference tournament, and if the standings remain the same, Loyola-Chicago, Evansville, Southern Illinois and Indiana State will be the ones left out. As teams start to clinch their spots, these 10 teams will fight for one of those six coveted spots in the MVC tournament.